White Glacier is a valley glacier in the Expedition Fiord area of Axel Heiberg Island, Nunavut. It extends in elevation from 1782 m to 85 m a.s.l. and at present occupies 39.4 km2, having shrunk by gradual retreat of its terminus from an extent of 40.2 km2 in 1960. Sea-level air temperature in the Expedition Fiord area averages about –20 °C, but the glacier is known to have a bed which is partly unfrozen, at least beneath the valley tongue; ice thickness is typically 200 m, but reaches or exceeds 400 m locally. Annual precipitation at sea level is very low, about 100 mm, although annual accumulation at higher altitudes reaches a few hundred mm. The annual ablation rate at the terminus of White Glacier ranges between –1000 and –4500 mm a–1 w.e., although values between –2000 and –4000 mm/a w.e. are more typical. There is now evidence that the retreat of the terminus, previously about –5 m/a–1, is decelerating. White Glacier’s larger neighbour, Thompson Glacier (384 km2), has been advancing in a state of „slow surge“ since the time of the earliest photographs in 1948, but recent measurements of its terminus show that it has now begun a slow retreat. 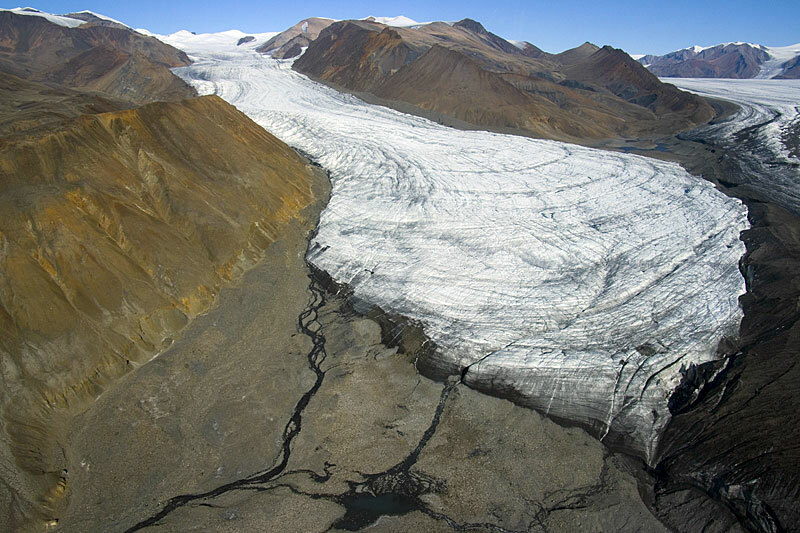 The terminuses of the two glaciers have been in contact since at least 1948, but, although the two terminuses remain distinguishable, White Glacier has become a tributary of Thompson Glacier. 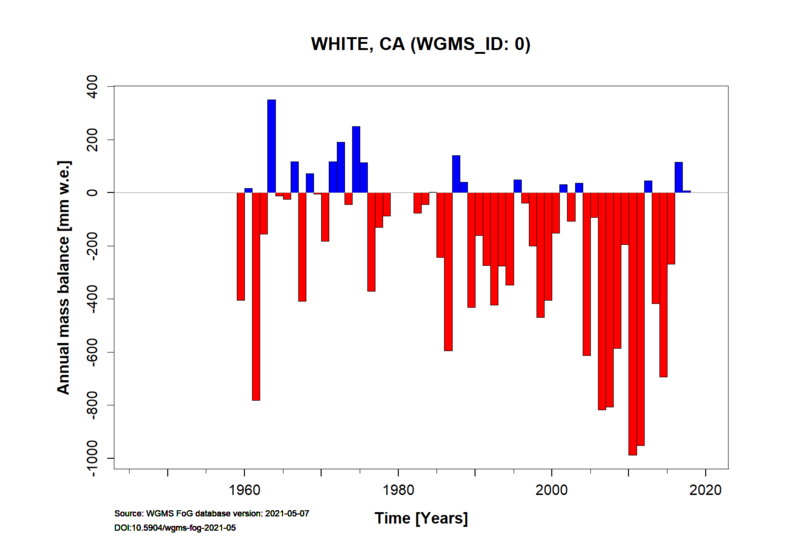 For information on the status of the glacier and on data relating to annual mass balance and other measurements, visit the WGMS Fluctuations of Glaciers Browser. Height min: 85 m a.s.l. Height max: 1782 m a.s.l.